We get a lot of birds around us. I am trying to learn what the different smaller birds are. I can recognize blue jays, robins, crows, chickadees and cardinals. A lot of times I will just call small grey birds finches. Some day I would like to get a bird feeder and a book to help myself learn what the different birds are. For now, I will rely on friends. A few days ago I was able to get a couple of quick shots through a window of something I did not recall seeing around here. Turns out it is a starling. Well, I’m pretty sure they are starlings. If anyone knows otherwise, please let me know. We had a good view of something hanging out in the tree next to the building since the leaves are not full yet. Better camera means better photos, even through the bathroom window. I am thinking it is a chickadee. Again, if anyone knows otherwise, please let me know. Cole even got in the bird watching this time. 2013 was a year of firsts for me. It all started on New Years Day when I tried Brussels sprouts. Turns out of l love them! Other firsts include but not limited to (mostly knitting related): making an i-cord (so damn easy, why was I so afraid? ), tried crocheting (did not go so well because of my hand problems), holding a fairly newborn (becoming an aunt count? I think so), using a round loom (love), trying shampoo bars (and loving them), trying a pumpkin spice latte (love). Holding my niece for the first time was pretty nerve-racking. I never held a newborn. I was pretty prolific in my knitting, twenty-one items. One of my favourites was owl bookmarks. I made one for Mr. Geek and one for me (brown for him, grey for me). 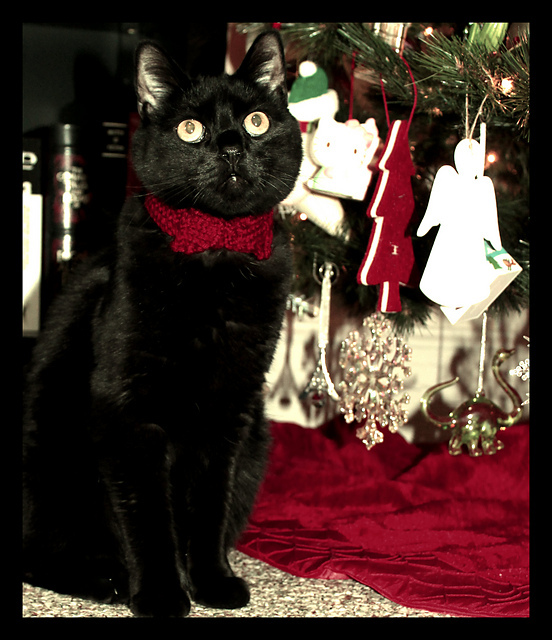 I also had fun making Cole a bow-tie. I finally finished the alpaca scarf. 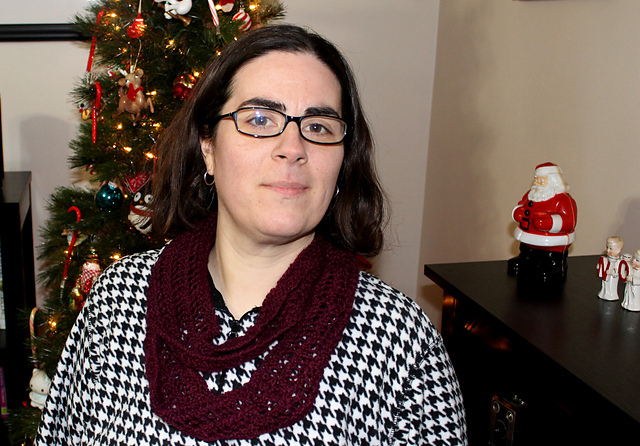 I decided to make it an infinity scarf. Before washing it I was having trouble wearing it, afterwards, it’s fine. This makes me very happy. Yay an animal fiber I am not allergic to! I’m starting to formulate plans for my knitting in 2014. It’s time I finally try knitting in the round and making Mr. Geek the scarf I said I’d start this year. I see a trip to a yarn shop in our future soon to pick out yarn. Hope everyone had a lovely holiday, what ever one you might celebrate. Have a wonderful new year!